In the true sense of the word "documentary," Somnur Vardar's feature length dialogue, Beginnings truly observes its subjects whether they be student researchers or villagers living on the outskirts of Turkey and Armenia. The premise, as outlined on a title card during the opening moments, follows a group of youths from both Armenia and Turkey meeting in two cities on either side of the divide to reconcile the past, present and future of their perpetual conflict stemming from the Armenian genocide of 1915. 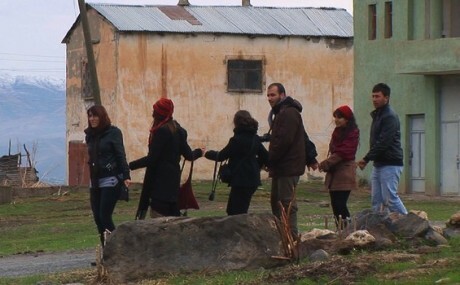 Their first stop is Mush, a village in Southeast Turkey where many Armenians lived prior to 1915. In interviewing villages and exploring various memory sites, the youths learn mostly that the past is something forgotten despite peripheral effects of the situation still lingering. One girl notes that a Kurdish villager is unable to get a proper education for her child, since all available options are nationalistic and primarily Turkish speaking. Another member of the project discusses the overall lack of history observed, pointing out that the Turkish residents believe the diasporic Armenian visitors were either German or British since they spoke primarily in English. These explorations of memories in relation to the present state open up an interesting dialogue about the nature of preserving history as a means of evaluating modernity and educating people to learn from historical error. What's less interesting are the endless, circular conversations about feelings and perception amongst the youth group, who routinely whine about petty slights and arbitrary issues like "insensitive" word choices and subjective reaction. This becomes ever tiresome by the time the group regroups in Gyumri, Armenia where many of those displaced from Mush went to settle. The resentment this time out is more palpable, with group members complaining about comments made on Facebook—and other minor gripes like the comparison of a memorial site to an unorganized marketplace—now that the idealism and whimsy of an identity-shaping endeavour is wearing off. If anything, it suggests that the title of Somnur Vardar's very amateurish, naturalistic documentary is intended to be ironic. True, the beginnings of this experiment have some promise in a grassroots, optimistic, hippie-dippy sort of way. But, like most attempts at conflict resolution and compromise, good intentions turn sour when the focus shifts from the bigger picture to puerile trivialities representing a bigger, inherent sense of collective moral superiority manifesting in passive-aggressiveness. Without any sort of structure beyond linearity and no sense of pacing to frame this series of captured moments, it's difficult to tell what Vardar's bigger message or idea, beyond the obvious subject, actually is. Still, the unveiling of human contradiction and gradual defeat is, in itself, quite telling about why so many conflicts never really manage to get resolved.